Liquid to inject, with low viscosity, characterised by alkaline silicate bonds and stabilized silicones with remarkable water-repellent characteristics. It is used for the preparation of retrofit horizontal barriers and sealing of masonry and concrete surfaces against humidity coming from the bottom or from the exterior due to the capillary effect. 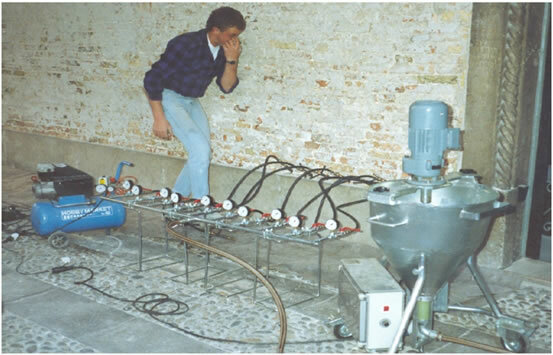 Once applied, JEKTIPAL transforms the free lime contained in the material in calcium silicate, filling or impregnating the capillary system. It constitutes a horizontal barrier or extensive, long-lasting and effective insulation. Test certificates: JEKTIPAL's characteristics and application. Test institute for building materials Dr. Gunther Bottcher 31/5/1983. Perform a few holes of 30 cm diameter, 30° angles, in linear sequence or offset, at maximum distances of 12 cm. Once the chips have been removed, soak JEKTIPAL holes until the complete saturation of the capillary structure. Do not exceed a waiting time of 8 hours between the single applications. 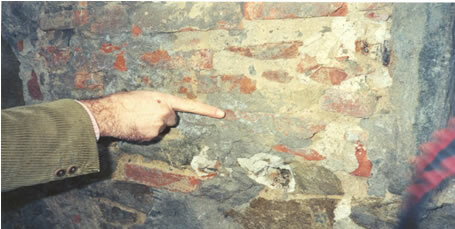 Stucco the holes with IPATOP SM or injection mortar. In case of walls with thicknesses over 60 cm, soaking must be done from both sides. Perform holes of diameter of 13 or 22 mm, with about 25° angle, in linear sequence or offset, at a distance of 12 cm. The depth of the hole must correspond to the thickness of the wall, less 5 cm. Once the chips have been removed, prepare the nuts or injectors. Inject JEKTIPAL. The injection must take place until the complete saturation of the capillary structure, introducing JEKTIPAL in each nut/injector for a suitable timeframe. Remove the nuts/injectors and stucco the holes with IPATOP: SM or injection mortar. In case of cavities and double-face walls, in order to obtain a compact structure, a pre-injection (prefilling) must be performed with injection mortar or lime or cement suspension with the addition of IPA PM in powder. Restoring plaster should be applied at the same time. (IPA E64) This process is not suitable for walls subject to the action of water under pressure. Protect the windows and parts treated with electro-colour, clean the tools and injection equipment with water. Our warranty concerns the quality of the product and not the applications which are outside our control. The information contained in this sheet is based on our current knowledge and experiences. In any case, it cannot be considered as guarantee, neither liability towards us, for the use of our products since the conditions of use are outside our control. Moreover, the Client must check that this sheet and possible values contained in it are valid for the batch of product that he intends to use, and make sure they are not outdated by following editions and/or new product formulas. In case of doubts, contact our Technical Office.